You are here: Home > News > News > WOW Zone Success in National Film Awards! 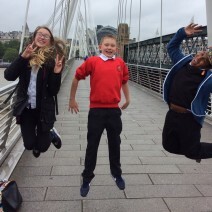 The WOW Zone team is proud to announce that 3 of their students received 3rd prize from a field of 130 entries in the national film competition run by Childnet at a prestigious Award ceremony in London on Monday, 13th July. The WOW Zone, based at Woodhouse Park Lifestyle, is part of Wythenshawe Community Housing Group’s community investment programme, providing high quality and innovative learning programmes to young people in Wythenshawe, South Manchester. They work with local schools on a variety of creative and technology-based projects, with the aim to help raise children’s aspirations in Wythenshawe and equip them with the knowledge and skills to enter the modern age of computing. The students went to London, accompanied by WOW Zone teachers Lisa Whitaker and Louise Zwanepoel, where young people from around the country met to see their films being showcased in front of a panel of judges. The judges included, amongst others, David Austin – Assistant Director of the BBFC (British Board of Film Classification), Lily Pebbles – YouTuber and blogger and Jude (aged 10) – a two times finalist in the competition. After the screening of the WOW Zone entry, the children were invited to the front of the auditorium to be interviewed. Louise Zwanepoel, WOW Zone Assistant Teacher, said: “I was so proud of the children and the confidence they exuded when speaking in front of such a large audience. It was clear to everyone that they were having a wonderful time”. David Austin described the entry as showing “really good creativity”. He went on to explain that “…Stop Motion animation is extremely difficult to do, and it was done with great skill!”. The children won a Canon DSLR camera, lighting equipment, a clapper board and trophy for use at The WOW Zone. This will enable them to continue to deliver and develop provision for children and young people in Wythenshawe. They students also received a certificate of participation and their film received an official certification which means that it can now legally be shown in any cinema in the country!